When tofu came along with it’s low-fat, high-protein goodness, Mom replaced the Paneer in her Paalak Paneer recipe with extra firm tofu and the revamped dish continued as a family favourite. The way Mom patiently and uniformly browns the tofu makes her dish to die for! It’s time to share with you Mom’s Tofu Paalak recipe with my addition of flax seeds to sneak in some omega-3 (good fat). Serve this spinach side dish with rotis of any kind. You could also add a little water while grinding the spinach mixture to loosen the gravy and serve this dish with rice. This recipe is suitable for diabetics, weight watchers, and tofu and spinach connoisseurs. Use only Extra Firm Tofu for this dish. Do not use any type of “silken” tofu as it crumbles too easily! In India, you can use RK’s Soya Paneer or Ka Kim’s Tofu. Add a dash of garam masala while cooking for an extra dose of North Indian-ness! Use almonds instead of cashews if you prefer. Brown the cubed tofu and sliced onion lightly but uniformly for optimum chomping. Perfect! Creamy curry with no butter, cream or coconut milk! 🙂 will need to convince my non-vegan mum to give this recipe a go. Yup, you should! 🙂 Happy munching! Oh that is so awesome Sophie! Yay! Thanks! Never thought of using tofu instead of paneer. Thanks as I am giving up cheese. You’re welcome, Emy! If you can use firm tofu and brown it well.. the texture is quite similar to paneer. It’s great to see your mother’s recipe Priya 🙂 .It looks amazing and the idea of adding cashews too ! This sounds great! The graphics in this post are so fun too. Thanks for sharing. Love how tofu is in the paneer! Thanks for sharing your mom’s recipe, Priya! 🙂 I do have a question: What is garam masala?? Thank you! Garam Masala is a North Indian ground spice mix that’ll be sold in any Indian food store in your area. It’s got black pepper, cloves, cardamom, cinnamon, bay leaf, and sometimes others like cumin, coriander, dry ginger and nutmeg. You can add about a teaspoon or more while cooking to give a slightly spicy/warm, and flavourful taste to your dish. Thanks Priya for where to buy it. 🙂 Is it better to make it by yourself though?? 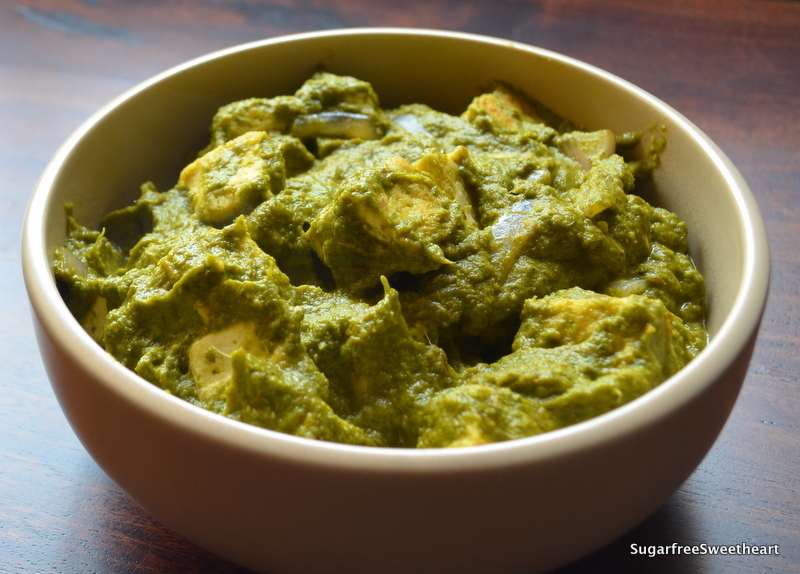 A very healthy take on palak paneer Priya. Amused to see the use of cashews in this dish. Have to try it out with cashews :). Thanks, Sonal! Cashews give it a richer, creamier taste. You know, I was not too happy with the photo but glad I posted it anyway because the recipe is worth sharing! Thanks Sophia! So glad you did! I love Indian food, it’s my husband and my favourite. Although I rarely make it at home because there are usually many ingredients that I am not familiar with and unsure where to get them. I love this recipe because it’s so simple yet delicious (I’m sure). I feel the same about ingredients like quinoa flour or even things like raspberries and blueberries. It feels awesome when you can use commonly found ingredients to make recipes from different cuisines! Please keep posting your mother’s recipes. This tofu paalak is amazing! Thanks (on behalf of Mom)! And yes, more of Mom’s recipes to come! I love Paneer, but that looks lovely! You should try it sometime, Morris. It’s quite like Paneer but well, also quite different! 😀 Congratulations on your impending book release by the way! That’s awesome!